[Num,Den,AllpassNum,AllpassDen] = iirlp2xn(B,A,Wo,Wt) returns the numerator and denominator vectors, Num and Den respectively, of the target filter transformed from the real lowpass prototype by applying an Nth-order real lowpass to real multipoint frequency transformation, where N is the number of features being mapped. By default the DC feature is kept at its original location. [Num,Den,AllpassNum,AllpassDen]= iirlp2xn(B,A,Wo,Wt,Pass) allows you to specify an additional parameter, Pass, which chooses between using the "DC Mobility" and the "Nyquist Mobility." In the first case the Nyquist feature stays at its original location and the DC feature is free to move. In the second case the DC feature is kept at an original frequency and the Nyquist feature is allowed to move. It also returns the numerator, AllpassNum, and the denominator, AllpassDen, of the allpass mapping filter. The prototype lowpass filter is given with the numerator specified by B and the denominator specified by A. Choice of the feature subject to this transformation is not restricted to the cutoff frequency of an original lowpass filter. In general it is possible to select any feature; e.g., the stopband edge, the DC, the deep minimum in the stopband, or other ones. The only condition is that the features must be selected in such a way that when creating N bands around the unit circle, there will be no band overlap. Transform the lowpass filter to an IIR real N-point filter. 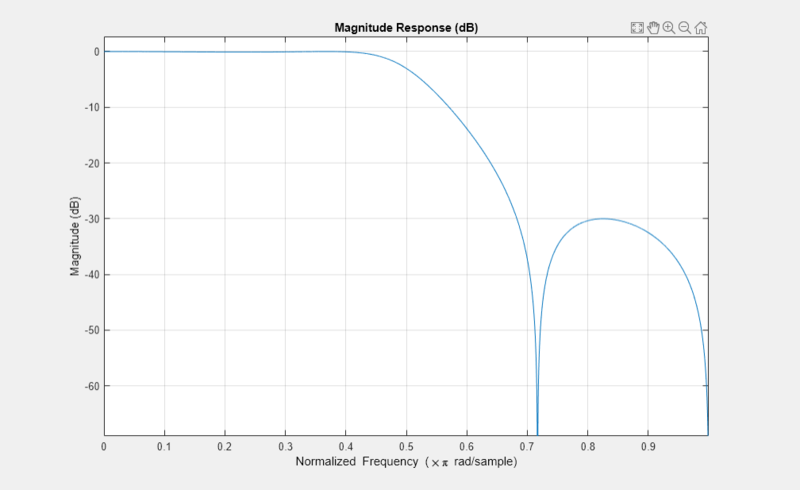 Compare the magnitude responses of the filters using FVTool. Cain, G.D., A. Krukowski and I. Kale, “High Order Transformations for Flexible IIR Filter Design,” VII European Signal Processing Conference (EUSIPCO'94), vol. 3, pp. 1582-1585, Edinburgh, United Kingdom, September 1994. Krukowski, A., G.D. Cain and I. Kale, “Custom designed high-order frequency transformations for IIR filters,” 38th Midwest Symposium on Circuits and Systems (MWSCAS'95), Rio de Janeiro, Brazil, August 1995.